Property Size 1,324 sq. ft. 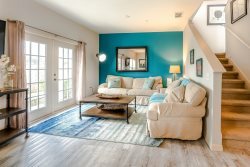 This BRAND NEW townhouse is located at the West Lucaya Villages. It has brand new furniture and appliances to best fit your needs. Most of the furniture are made from wood, providing a rustic and comfortable atmosphere, which will make you feel at home. You also can count on complimentary Wi-Fi, cable TV, and home phone, in order to make your vacation even more enjoyable. Excellent property and very nice! We had a Great time and look forward to our next visit! Excellent customer service. Very professional personnel. The property was simply amazing. Extremely comfortable and provided everything we needed. We really enjoyed staying in this house since it was comfortable, clean, and nicely decorated. I loved the property...felt like I was in my own home. Wonderful accommodations. Perfect for our family of five.